In a follow-up to her autobiographical one-woman play You’re In My Blind Spot!, which was presented by Breakthrough Workshop Theatre at the 4th Annual San Diego International Fringe Festival in 2016, 22-time Breakthrough Artist Terri Bratcher returns to Martinis Above Fourth | Table + Stage with the debut of her brand-new musical cabaret, The Legally Blind Ambition Tour. Audiences at this funny and poignant retrospective will learn about Terri’s one-of-a-kind artistic journey through an evening of eclectic music and heartfelt stories, exploring her challenging obstacles, her inspiring triumphs and the breakthroughs she’s had along the way. 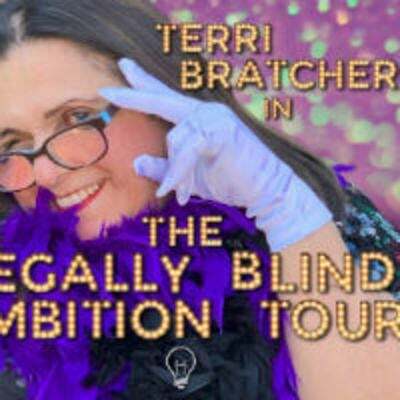 To learn more about Terri’s story, read her “Inspiring Artist Profile” from San Diego Voyager Magazine: http://sdvoyager.com/interview/meet-terri-bratcher-of-breakthrough-workshop-theatre/.